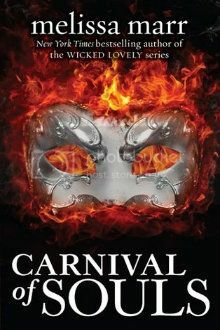 Goodreads Summary: In a city of daimons, the Carnival of Souls hosts a deadly competition. Once in a generation, every citizen can fight to join the ruling elite. Without the competition, Aya and Kaleb would both face bleak futures—if for different reasons. For each of them, fighting to the death is the only way to try to live. In our own world, Mallory knows that her father—and every other witch—fled the daimons’ city long ago. She trains to be lethal because it’s only a matter of time until the daimons catch up with them. While Mallory possesses little knowledge of The City, every inhabitant of The City knows of her. There are plans there for Mallory, and soon she, too, will be drawn into the decadence that is the Carnival of Souls. From Melissa Marr, bestselling author of the Wicked Lovely series, comes a brand-new tale of secrets, love, and the struggle to forge one’s own destiny. I have wanted to read this book since I heard Melissa Marr talk about it at a signing. I love stories of magic and intrigue, and it sounds like Carnival of Souls will be just that! Ha ha. I was just thinking about this book as I got on my computer! I can't begin to imagine how this series will go. I loved the Wicked Lovely books, but they could have gone darker. I bet these will.